Phoenix Lights was a gathering that could not be missed by earthlings and aliens alike. With a bass filled sound system and floodlights shooting towards the heavens, it is nearly certain that interstellar beings intercepted our communications. While I can’t say I saw any abductions or probings happening, there was plenty of evidence that aliens were in our presence. Beings in white decorated the grounds, blown up aliens crowd surfed the dance floor, and a totem of a light up flying saucer moved about the venue. This show commemorated the 20th anniversary of the Phoenix Lights event when thousands of people in Phoenix, Arizona and Sonora, Mexico saw an otherworldly object in the night sky. While the military insists that people were witness to flares being dropped from an aircraft, observers believe otherwise. What is responsible for the Phoenix Lights UFO spotting? Was it human or was it, intergalactic dancer? 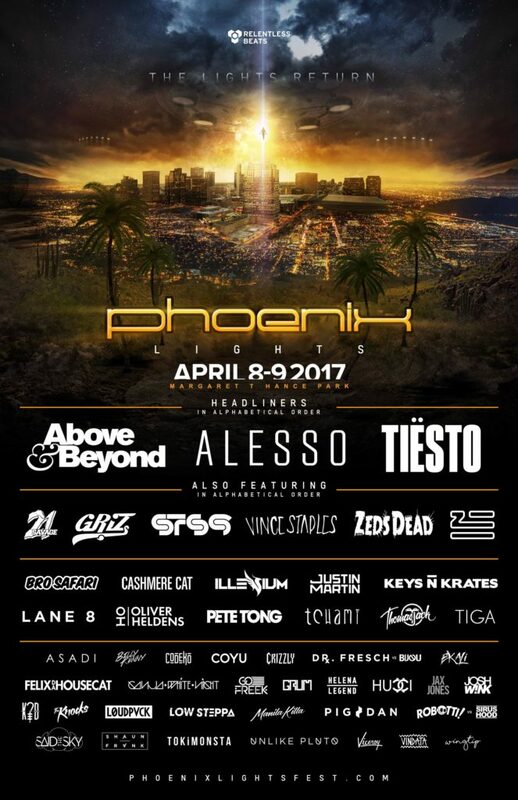 No matter what kind of EDM music you prefer, Phoenix Lights provided an experience that will not be forgotten. The array of music offered stimulation of the ears for everyone in attendance. With headliners such as Tiesto, Alesso, and Above & Beyond, the lineup provided a full helping of trance at the Mothership. For those heavier wubs, the Invision stage provided performances by Cashmere Cat, Keys N Krates, and Ganja White Night. This stage also featured Bro Safari and GRiZ who were arguably the best sets of Saturday and Sunday. For those not feeling the heavy wubs and trance? The Colony stage was full of techno beats that made one boogie the night away. Bro Safari was a wild adventure of wubs and flashback visuals. With fast paced trap, moombahton, and dubstep influences this set had the crowd energized like the energizer bunny. With some of the most built up drops of the night, Bro Safari had the crowd in constant motion. In addition to the amped-up jams, the stage visuals were some of the most memorable of the night. Memberberries of Austin Powers and Pokeballs unleashing the audience’s inner child. Hop on the nostalgia caravan and join Bro Safari at Middlelands. Sometimes the phrase “they saved the best for last” is just a saying, other times it is the reality. In this case, Griz made that phrase reality. As always Griz brought just the right mix of groovy jams, dramatic transitions, psychedelic visuals, live saxophone and stage lighting. His music has a richness to it that is unique yet familiar, with the genres rightfully dubbed electro-soul and future funk. The speakers pump out wavelengths that oscillate through your body like a massage for your inner being. Like always Griz’s performance was a positively charged experience for the entire body, mind, and soul. Check out Griz at one of the many music festivals he will be playing this summer or his inaugural Red Rocks Show. The Phoenix festival goers take fashion to intergalactic levels. At Phoenix Lights, alien themes, reflective materials, light up space shoes and fiber optics whips were common in the crowd. Some partiers took fashion to even higher levels with space or jumpsuits. Other festival goers went crazy with the glitter, covering everything from beards to booty cheeks with a sparkling luster. Many attendees took advantage of the warm weather wearing pasties or sleeveless outfits. And for those that got cold, there was always the warmer inside Invision stage. Festivals are about treating yourself, and what better way to treat yourself than with some delicious food. Phoenix Lights offered out of this world food including the essentials like chicken & waffles and tacos. Anything that you were wanted or craved, they had it. Victim of a sweet tooth? No worries there was a wide array of desserts, ice cream, deep fried twinkies/Oreos and funnel cake graced the grounds. Personally, I was taken aback by a mountain of mac and cheese piled high with chicken, bacon, and ranch dressing. And as much as I tried to resist falling victim to my sweet tooth, I eventually caved and bought a sour peach licorice stick to share. Thank you to Phoenix Lights, we will definitely be back next year!